a resident of Winterley made a passionate and urgent request for a footpath to be made from the Dingle corner to the Skate Park in Haslington. He had handed in a petition to the Chairman that had been signed by many people regarding this issue. He said that the traffic along Maw Lane was increasing and no notice was being taken of the speed limit along there. 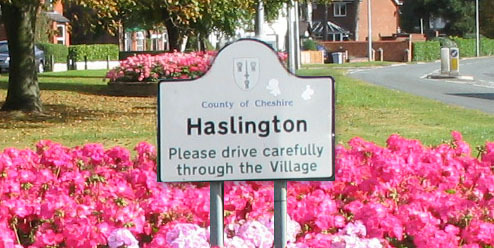 The children were walking towards the middle of the road and when told they should be walking at the verge of the road they replied that traffic coming from neither Haslington nor Crewe could see them because of the bends. This problem has been raised many times before, but the Parish Council came to the conclusion that this was now an urgent matter and needed to be addressed by Cheshire Highways. The Clerk was asked to write to the relevant authority to ask for their urgent attention before a tragic accident occurred. A request to have a tree planted on or near to the Red Cross Hut was made by Mr Ivor Glover in memory of his wife Ruth Glover. This was agreed and was to go ahead. The grass cutting in Shelburne Drive was needed urgently as it was very overgrown. This to be reported to the relevant authority. A police report had been sent to the Chairman regarding police activity in the village. This showed that speeding and involvement in all areas i.e. foot patrols, visits to the schools and churches, and crime surveys had been carried out. The potholes in Kents Green Lane and Newtons Lane in Winterley had still not been mended and were a danger to motorists and all the road linings had been removed in Clay Lane and Maw Lane. The hedges from Kents Green Lane to Winterley House Farm needed cutting as did the hedge from Winterley House Farm to the field gate on Crewe Road. The hedge in Pool Lane/Crewe Road needed cutting also. Mrs Yvonne Bushill thanked the councillors who had attended to opening of the Oakhanger Church. The Red Cross Flower Show had been a success and was also attended by the local PCSOs. Councillor Hammond reported that the quota of houses to be built had been reached. There had been a request from a resident regarding his ancestors who lived in the village. The Vice Chairman had researched this matter and was to send the information on to the resident. The flower stand that had been destroyed by a vehicle backing into it had been taken away and hopefully would be replaced shortly. The resident who had committed the damage reported it immediately and was very contrite. The flower stands in the Parish this year were absolutely beautiful and this was due to the watering throughout the very hot weather. Thanks, were paid to George Farrall for his part in this. The organisation for Remembrance Sunday was discussed and hopefully a vicar would be available for this service.